Labor Day weekend is the best description of what our weekend was. It was not a lazy laid back weekend, it was a work weekend. Friday we planned to take the lawn mower to the John Deer dealer for service work. One of us, probably me must have run over a root or something and caused a vibration problem with the deck. Sonny borrowed my cousin’s flat bed truck and pull trailer. He tried to put the lawn mower on the trailer, but the trailer wasn’t wide enough by about 3 inches. So we decided to put it on the back of the flatbed. We made some make-shift ramps from a couple of 2×6’ss and Sonny drove the mower up on the flatbed, but it wasn’t all that easy. The boards were to short and made the ramp steep and the mover deck dragged. It required me to help push the mower to get it started up the ramps. We got it up on the back and strapped it down with some ratchet straps. Off to the dealer. On the way home we decided to stop by Lowes and pick up a log splitter. It won’t be long before we will need some heat in the house and we have to get stocked up on wood. There was a time when Sonny could have split all the wood by hand, but shoulder problems prevent him from doing that now. So Sonny and a Lowes salesperson got the thing loaded on the flatbed. They have better ramps than our wooden substitutes. Getting that thing unloaded was a job, but with teamwork we got it done. Sonny had a big pile of wood split in no time. It was definitely worth the investment. We also did a lot of little jobs that needed to be done around here. We put up a proper clothesline, put up some shelves in the electrical room, cut grass the old fashioned way with a push mower and built a platform for the generator to sit on so it is up off the ground. 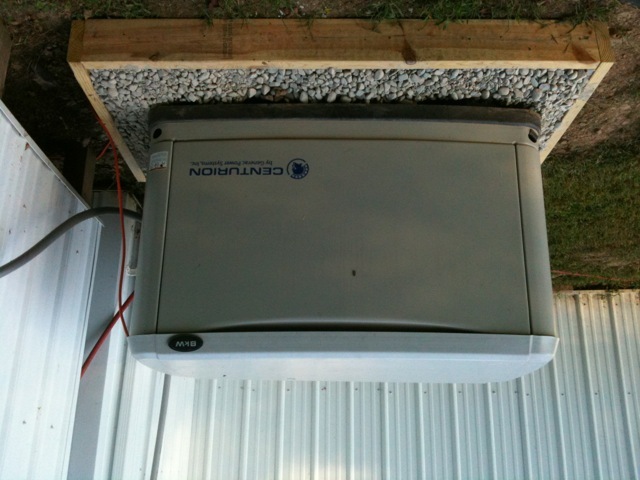 We used 2×6 boards for the frame and then placed the generator on cement blocks. We then filled the frame with gravel. This way the generator no longer sits in mud or snow. We did manage to enjoy a nice Labor Day BBQ with John and Carol. It was a great ending to a busy weekend. This entry was posted on Monday, September 6th, 2010 at 7:23 pm and is filed under Alternative Energy, Generator, Off-Grid, Solar-Powered. You can follow any responses to this entry through the RSS 2.0 feed. You can leave a response, or trackback from your own site. Glad you got the ramps. My husband was loading our tractor in his truck using 2x6s when the boards gave way and the tractor fell on his shoulder. He ended up having two surgeries but still isn’t 100%. Love your blog. We have a weekend farm in Wood County. I can’t wait to live there full-time! My friend John has ramps but I didn’t think I needed them because we planned to use the smaller pull trailer to load it. I have to put a set on our “need to get” list before one of us end up getting hurt. Thanks for reading and commenting. We appreciate the readers. I don’t think you will ever regret moving out to your farm full time. Even though at times our place is hard work and sometimes we learn lessons, we wouldn’t want to be anywhere else. It is so rewarding to see the things you accomplish on a daily basis and just having the ability to feed yourself from your garden is awesome. Keep in touch and let us know how your farm adventure goes. Sounds like you all are doing very well for yourselves up there! I am happy for you guys, you deserve it! 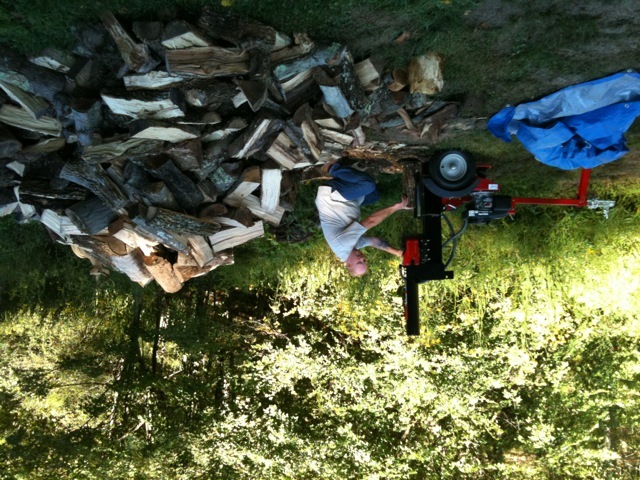 That log splitter has made all the difference. When I was young I did all the splitting with a maul and a wedge. I have seen many cords go by me over the years. My shoulders have paid the price for all that energy. I only know a maul and a wedge! Never used a splitter proper. Seems they wern’t around then, or, I was dad’s cheap labor. This is my first also. But I can certainly feel how much easier it makes doing the job.